We are pleased to have Hedren Sum (SG) from NTU Libraries and Darrel Manuel Marco (PH) from Xavier School Nuvali to share their insights with us on Digital Storytelling. Make sure you click all tabs (Discover, Explore, Activities and Thinking Points) to get to the end of the lesson. Storytelling is nothing new. In fact, it has been around for thousands of years, with the earliest form found at the Lascaux cave paintings created more than 17,000 years ago. Storytelling never went away, but rather there was a change in medium. According to Weich J. (2013), we are not experiencing something new. We are merely experiencing a “storytelling renaissance” fuelled by the developments in social media and mobile, given that most of us are in touch every hour of the day. This phenomenon leads to the growth of digital storytelling, which is basically the use of new media tools and platforms to tell stories. Regardless of what platforms you use or how many new ones are coming up, stories essentially still come from us and storytelling is a thing that truly connects. Australian regional communities were telling their own stories in the @ABCOpen Day in the life project to capture a typical day in your life, or the life of someone you know, in a short video. A lot of people share information about #digitalstorytelling on Twitter, frequently with links to apps and project websites. Libraries collaborating with communities–making and sharing stories including projects like the Queensland Stories Project and the Singapore Memory Program iniated and supported by the National Library Board of Singapore (read more in Chris Tang’s IFLA paper). Four LIS students explored the concept of digital storytelling for communities. Some Digital Storytelling tools on your mobile device include: Animoto (iOS and Android apps available) Prezi (iPad app only), Voicethread (iOS app) and Slideshare. Find more digital storytelling links to explore on our Pinterest board. Think about your last holiday trip or the experience you have had for this 23 Mobile Things initiative. Share it with us through this blog. You may use the tools or applications, such as video apps, photo apps, Slideshare, Prezi, etc., that you have learned from the previous Things to create your content. What are the existing or potential roles of your library in helping communities keep their own stories? Follow 23mobile things’s board Digital storytelling on Pinterest. Darrel Marco works as a school librarian in Xavier School Nuvali. His passion is to spread the love for reading and literacy throughout the country. He has done different outreach activities, stoytelling mostly, to different rural areas in the Philippines. We are pleased to have Ms Engracia “Dhea” Santos (PH) from Rizal Library, Ateneo de Manila University to share her insights with us. Make sure you click all tabs (Discover, Explore, Activities and Thinking Points) to get to the end of the lesson. Recording and sharing sound is another feature of smart phones that is getting more attention these days. Different platforms are coming out for the musical arena where users can create audio files and share these to their friends and community. Remember, an audio-based interaction between a mobile phone and a human is an important area of Human-Computer Interface System. The audio messages may be more trustworthy, helpful, and unique than print messages. Some recent developments include emotions in audio signal such as a sigh, laugh, cry, among others. Voice interaction functionality is a common feature in the latest smart phone releases. Have you tried to verbally ask your phone to do something…? Have you tried verbally requesting your phone to make appointments with your professors? Or asking your phone to remind you of your date with your friend? Requesting your phone to capture your picture? How about searching your library catalogs using voice commands? These type of applications use simple and common language. And what’s even more exciting is that it may reply to you in a very personal manner. Recently, Google Chrome-browser launched voice controlled search. In the future, your browser may even begin to talk back. Share your experience on #23mthingsPhSg! Do you have visually impaired library users who will benefit with audio instructions? How about using audio recording to promote your library? Sharing audio files freely using SoundCloud or AudioBoo? Follow 23mobile things’s board Voice recording and interaction on Pinterest. Engracia “Dhea” Santos is a Librarian at the American Historical Collection, Rizal Library, Ateneo de Manila University. She is a graduate of Computer Engineering from Polytechnic University of the Philippines and completed her Masters in Library and Information Science from the School of Library and Information Studies from the University of Philippines. She is keen on maximizing the use of technology for the advancement of library and its clients. We are pleased to have Mr Brian Aljer B. Coballes (PH) from Ateneo de Manila High School to share his insights with us. Make sure you click all tabs (Discover, Explore, Activities and Thinking Points) to get to the end of the lesson. Mobile Music Apps : Music on the Go! I know everyone of us, in more than one point in our lives, have experienced one of these: While doing your exercise routine, you clip your iPod and listen to the latest dance song to energize you. When you are resting, you appreciate the soothing effect of classical music from your phone. You even feel the sadness of the rain while playing your childhood love song on your tablet. In whatever you do, you hear the sound, the rhythm, the music. Music, therefore, has become our way of life. Double Twist – is a delicious Android music player, podcast manager and iTunes sync app. The app is free to download with in-app purchases to unlock its full capabilities. Up Next – take a peek and rearrange upcoming songs and add songs, albums, or playlists. User friendly design – swipe through album covers to advance tracks, navigate album, and even adjust the settings. Rule the air – sync music, including ratings, playcounts and playlists, videos, and photos between your Mac/PC and android devices (installer is downloaded separately on Mac/PC). Wake up with your music – gently awaken to your favorite medley or violently rouse yourself from deep slumber with death metal (app is downloaded separately). Google Play Music – is a clean music app that makes it easy to discover, play, and share music. However, access to Google Play Music is not available to all countries. Cloud Library – while it doesn’t have the deep customization or power features like other music apps, Google Play Music’s value comes from its huge cloud library. After all, what’s the use of powerful music app without music to listen to? Get smart recommendations based on your tastes. User-friendly features such as built-in equalizer, lyrics, sleep timer, gapless playback, and artwork downloading. Provide options to automatically pause playback on headset disconnect, resume on connect, and activate gapless playback. Poweramp – an app for serious music fanatics that allows high level customization. Unfortunately, this app is available for trial only. All-in-one main screen – enjoy a main screen that has a large album art and touches and gestures sensitive. The app will search and download for missing album art automatically so you don’t have to worry of annoying generic mime types. Powerful equalizer – gets into hype with 10 band graphical equalizer, preamp control, and tone controls. 16 pre-sets are already included so put your mind at ease and enjoy your favourite music. Widgets and lock screen – love the Poweramp 4×2, 2×2, 4×2, and 4×4 configurable widgets. Last.fm is a music discovery service, they have apps for Android and the Scrobbler app for iOS. SoundCloud is an online audio distribution platform that enables users to upload, record, promote and share their original recordings. Apps are available for for Android and iOS devices. Rdio is an on-demand digital music service with a range of apps available for iOS, Android, Blackberry and Windows phone. • A great way to share music – an exciting update has been released to double Twist Player that gives you the ability to share music on Facebook or Twitter. When your followers/friends click on your Facebook or Twitter link, they will be welcomed by the artist’s bio, concert dates, news and music video. • Double Twist sync for Windows – using Windows app, songs can be synced to your mobile devices. Install the double Twist app from Google Play (Android only) or Spotify (Android and iOS). Upload songs on your device for double Twist, or make a playlist using Spotify. Despite the popularity of music apps, how else can we incorporate these in the services/projects of the library? Has streaming changed the way you listen to music and how you discover new music – or if you are new to streaming – do you think it will? Does your library offer a music download or streaming service for clients? How do you promote it? Could you use Soundcloud to promote a local “Loud in the Library” or “Battle of the Bands” event featuring original music? Producing digital music is one of the popular programs offered to teens at Chicago’s YOUmedia library, have you considered music themed programming for your library? Follow 23mobile things’s board Music goes mobile on Pinterest. Brian Aljer Coballes is a Librarian at Ateneo de Manila High School. He is very active in the University of the Philippines Library Science Alumni Association, where he has been serving as an officer and board member for the past several years. His speaking engagements involve digital media and, digital repositories, and open-source software. He is also a lecturer on Adobe software in the Ateneo High School. We are pleased to have Mr Somasundram Vellayan (SG) from Nanyang Technological University Libraries and Ms Rhodora Valdez (PH) of De La Salle Santiago Zobel to share their insights with us. Make sure you click all tabs (Discover, Explore, and Thinking Points) to get to the end of the lesson. “Productivity is spending your time on working towards your goals,” some would say. App developers have seized on the iPad, Mac, Android, Windows as a tool that’s portable and flexible enough to accomplish the many different things people need to get done, organize task and schedule activities. For me (Soma), productivity means getting more tasks done efficiently and the outcome should be effective. Here in Singapore, we even have a public outreach campaign called Way to Go, Singapore! to gear us towards higher productivity. Being productive is no rocket science. Some organizations launch their own mobile apps to improve productivity of their employees, like Orlando Brewing Company has done in this video. In this Thing, we’d like to look at few of these tools. Thankfully, there are already some mobile apps out there which we can use to ensure productivity. iTunes has a long array of productivity apps but here are few which you might find useful. Doodle is used for scheduling to get mutually available timings from others for meetings. It has been very useful to find out when my colleagues are all available for a meeting and certainly avoids the clutter of emails! Besides its mobile friendly interface, it also has an iOS app and Android app, which are available at a fee. Your first steps with Doodle from Doodle AG on Vimeo. Workflowy is a note-taking app which allows making a list of high level ideas and tasks, and then subdivide into smaller groups, without having to mess around with bullet points and pages of notes! It has free iOS app and Android app. Remember the Milk is a task and time management app. – besides mobile apps, it has a web app, sync for Microsoft Outlook, and Remember The Milk integrates with other apps such as Evernote, Gmail, Google Calendar. If you are someone who emails yourself of your tasks, you can email those tasks to your Remember the Milk account! GTasks is a simple and efficient to-do / task management app with both local and google account modes. You can customize your to do list, set reminder, share tasks with your friends, family members or colleagues and sync with your google tasks perfectly. With it, you will never miss a task and focus more on real things. Wunderlist is the easiest way to manage and share your daily to-do lists. Whether you’re running your own business, planning an overseas adventure or sharing a shopping list with a loved one. The Pomodoro Technique is a productivity system that breaks work down into 25 minute chunks to improve concentration. There are a variety of Pomodoro apps available for both iOS and Android. Productivity tools need not just apply to tasks management and scheduling. There are other productivity tools out there which can assist to achieve productivity even for social media tools. Some of these tools maybe useful for you, if you are managing a few social media accounts of your library. Hootsuite – a popular social media management tool, Hootsuite allows you to integrate various social media networks, including Twitter, Facebook, LinkedIn, Google+, Foursquare, MySpace, WordPress. Its dashboard gives bird eye’s view of all your social media accounts and you can schedule your posts, based on the timings that you can engage your users more. Buffer – Previously known as BufferApp. This is similar to HootSuite but the difference is its customized scheduling. This is useful if you have a group of people managing your library’s social media accounts and need to avoid flooding your users’ timelines. It allows you to set specific schedules. Basically, it buffers your posts and publishes your posts at the next scheduled timing. You can also publish immediately or set your own time to publish a specific post. It also provides analytics such as number of clicks in tweets, reaches, etc. The free account allows you to set up two social media accounts only. Buffer recently introduced Buffer Feeds where you schedule/share blog posts right from feeds! Applicable for the “Awesome” plan only. Sign up for the BufferApp account and connect to any of your social media profiles such as Twitter, Facebook, etc. Share your thoughts about Buffer and schedule it to be posted to your Twitter account. Do remember to put the #23mthingsPhSg hashtag! Take a screenshot of your post in the Buffer and tweet it with the #23mthingsPhSg hashtag! Does your library manage multiple social media accounts? Would these social media management tools (Buffer, Hotsuite, Twwetdeck) be useful for your library? Do you analyse the analytics and time to find out when is the best time to engage with them though such social media accounts? Do you often plan out your work or take notes at meetings? Would the mentioned productivity mobile apps be able to assist you? Would you be able to coordinate meeting times with your users or colleagues using Doodle? Could you use a tool like Wunderlist as a mobile project management aid? Are there some repetitive tasks that require focus and regular breaks (like filing, shelf reading and reshelving) – could you Pomodoro them? Could Lift be used as part of a lifelong learning library program for adults to allow them to set their learning goals and monitor their progress? Rhodora Espiritu-Valdez works as a Librarian at the Learning Resource Center of De La Salle Zobel. She is the adviser of the DLSZ Green Bloggers Club and considers herself an advocate for reading and literacy.Rhodora is also a storyteller, puppeteer and backpacker. We are pleased to have Ms Zarah Gagatiga (PH) from Beacon Academy to share her insights with us. Make sure you click all tabs (Discover, Explore, and Activities) to get to the end of the lesson. Let us start Thing 16 with a short video on The Future of Publishing. How did you find the video as a whole? Did it disturb you? What ideas struck you as you watched? What concepts in the video do you agree or disagree with? What ever impressions you took away from the video, it portrays a distinct characteristic of the time and the era we are in. We are living in very challenging environments prompting us, librarians, to examine the demands of the bigger society from us, as well as paradigms we’ve held as gospel truths of the profession. What an exciting time to be a librarian of this age! Indeed, we need to look at the changing face of publishing with an open mind and with an even more positive outlook. The rise of ebooks, ereading and epublishing has dramatic effects on the work we do in the library and the way we deliver services and programs to our readers. You put one vowel beside those words: books, reading, publishing and the game changes entirely. One way to traverse this changing landscape is through strategically analyzing it. Three things that matter in ebooks and ebook apps: access; technology and community. Ebooks can come in the form of locally created content converted into digital format. Ebook apps and ereader manuals exist, but librarians need to assist readers on handling technology of this nature. There are digital natives and digital migrants who both need a mediator who can speak both the languages of the newbie and the oldie. There is always something new in the ebook apps and ereader market. Librarians must be aware of what’s hot and what’s not to help readers make informed decisions on format or medium of ereader and choice of content. Librarians are valued resource persons to publishers and content creators who give feedback on the reading experiences and profile of library users. Librarians are conduits of technology and knowledge to readers, thereby developing sturdier intellectual and virtual structures of learning. Now here are links to blog posts I’ve made in 2011 and 2012, when during those years, I was in the process of developing an ebook collection in our school library. Caveat: I am a school librarian so the experience and practice I bring forth to this discussion is that of a school setting. I invite you to look at underlying principles and the process involved in building an ebook collection as these can be applicable for academic, special, corporate and government libraries too. It would benefit us all if you can take down notes of your own experience in your library so that we can enrich the discussion on ebook and ebook apps and we learn from each other. For a discussion on management strategies on ebooks, go to Ebook Issues. Click this link to read on Ebook Collection Development. Start an assessment of your library’s digital or virtual collection. What ebook services and subscriptions are available for your readers? Look at the different file formats of ebooks: Kindle (AZW), PDF, TXT, DOC, MOBI, PRC, HTML, EPUB, PPT, BBeB Book and more. What works best in your mobile device or your readers’? Understand what Digital Rights Management is all about and why is there a movement to democratize ebook access like the DRM Restrictions and The Right to Eread. Reading ebooks can be extended to writing and content creation. WattPad allows its subscribers to create as well as publish ebooks with in its online community. For aspiring writers, WattPad is a platform where they can test their stories to fans and followers, friends and readers who provide comments and feedback on their stories. This engagement leads the aspiring writer to improve the story, work on revisions and in the end, submit a manuscript to a publishing house. Halohalo Books offers free children’s stories written by children and adults. In our school, The Beacon Academy, our high school students have been writing and illustrating stories for primary readers. These stories can be downloaded and translated into mother tongue provided that the translation be shared with back to the school. This project is called Early Readers and you can access the stories following these steps. Read this article about the human brain and how it responds and works when reading printed books and ebooks. Tweet your response or reply using #23mthingsphsg or post it in FB via the 23 Mobile Things PH SG page. If you have an existing model for an ebook lending system in your library, write us a paragraph or two and share about it via the FB page of 23 Mobile Things PH SG. We will be very glad to hear your success story! Is there budget to begin an ebook collection? How can the IT department and administration support the library’s ebook project? Who are the readers of the library? Are they ready for individual, shared or institutionalized access of ebooks? What training sessions can be given to library users before, during and after implementing an ebook collection and circulation/lending system? The first five librarians to do and submit any of the three activities by May 31, 2014 will get one of my books for free through courier. What challenges do you face concerning ebook collection development in your learning community? How can you overcome the challenges you’ve identified? How do you promote ebooks to your readers? Lastly, watch these two videos: one of Lisa Bu How Books Open Minds and the other of Rica Bolipata Santos Books Matter. Ms. Bu and Ms. Santos may be talking about printed books as valuable tools and technology to gain knowledge and to uplift the human condition, but I invite you to look beyond the format. Either printed books or ebooks/ebook apps, we need to remember that our role as librarians to foster a genuine love of reading and promote a reading culture in our learning communities is paramount. We must be agents in paving the way to intellectual freedom and the right to read among our readers regardless of their age, color, creed, religious beliefs, political affiliations and sexual preference. A reading community learns! A learning community reads! Follow 23mobile things’s eBooks on Pinterest. 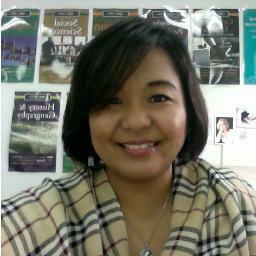 Zarah C. Gagatiga is a teacher librarian from the Philippines. She works in The Beacon Academy, an IB World School offering the MYP and DP. Zarah is also an influential blogger, avid storyteller, and board member of the Philippine Board on Books for Young People (PBBY) representing librarians. She is one of the staunchest advocates for books and literacy in the Philippines and had published 3 children’s books including 1 co-authored with Dianne De Las Casas, titled Tales From the 7,000 Isles: Filipino Folk Stories (ABC CLIO, 2011). Tweet her @thecoffeegoddes. Here’s the wrap up on the discussion for Thing 14 : Curating. Thanks Carina and Emiee for facilitating the session, and Juan Luis for first time appearance.